But most of us know this cannot be the whole story. Companies are showing no sign of being desperate to find workers, and the very low increases in worker salaries suggests that there is no bidding war for their services. So where do we find the hidden slack in the job numbers? For that, you have to look at another statistic that is compiled by the Bureau of Labor Statistics: the number of “discouraged” workers in the U.S. economy. The Bureau defines “discouraged” as “those persons not in the labor force who want and are available for work, and who have looked for a job sometime in the prior 12 months, but were not counted as unemployed because they had not searched for work in the 4 weeks preceding the survey.” These individuals, misleadingly, are dropped from the Bureau’s pool of available workers, and as they stop looking for work, they paradoxically help lower the statistical calculations of the unemployment rate. So what has been going on with the discouraged worker statistics lately? Here, we find some very good news. The number has declined from 522,000 this time last year to 373,000 today—reaching a level not seen since before the Great Recession. 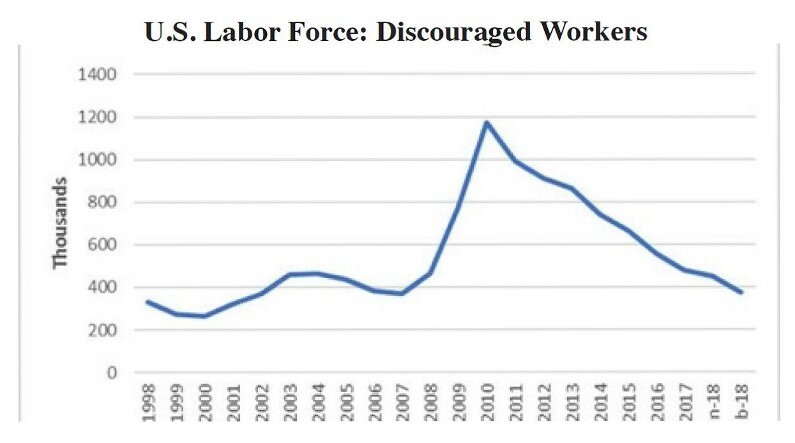 The chart shows the trend, indicating that we still have a ways to go before there are fewer discouraged workers than there were in the late 1990s, but that we are on a fairly steady path to getting there. What happens when the number of discouraged workers approaches zero? That’s when you’ll start to see wage growth begin to accompany the low unemployment rate. As the slack is taken out of the labor market, as we start to run out of discouraged workers, we will see that long-awaited bidding war for people in the workplace. The consequences from there are uncertain. It could lead to moderately higher inflation, or we could see technological advances which reverse the recent trends and put a lot more people out of work—such as, for example, self-driving trucks replacing truck drivers.